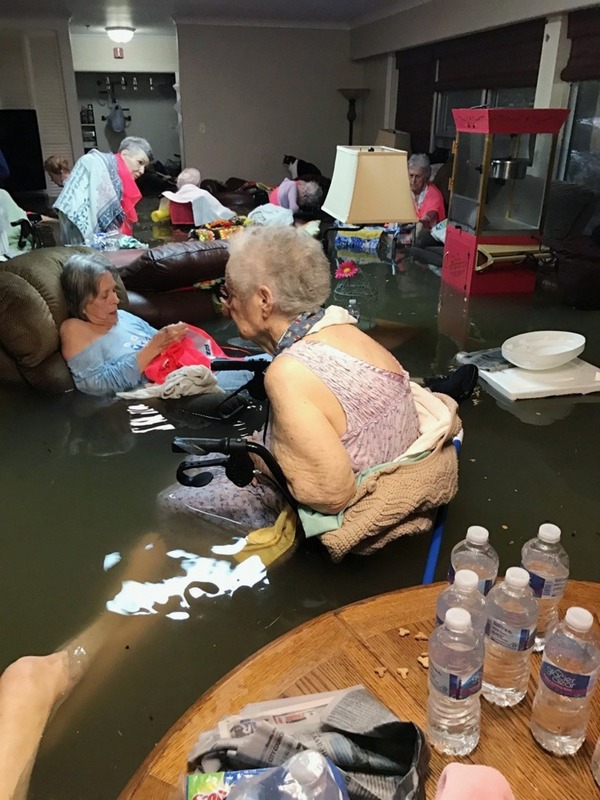 A nursing home in Dickinson, a low-lying city 30 miles southeast of Houston, quickly became the face of the crisis after its owner took a photo of residents, some in wheelchairs, up to their chests in water. The nursing home owner, Trudy Lampson, sent the photo to her daughter, whose husband posted it Sunday to Twitter, where it's been retweeted about 4,500 times. The photo was so dramatic that many users denounced it as fake. The nursing home residents were saved the same day. "Thanks to all the true believers that re-tweeted and got the news organizations involved," Lampson's son-in-law, Timothy McIntosh, posted later in the day. "It pushed La Vita Bella to #1 on the priority list." Not only are the people who need rescuing relying on social media for help, volunteers and police departments alike are posting their phone numbers and instructions on Twitter and Facebook so people can get more immediate help.